DALLAS -- Liberia plans to prosecute the airline passenger who brought Ebola into the U.S., alleging that he lied on a health questionnaire about not having any contact with an infected person, authorities said Thursday. On Sept. 19, Thomas Eric Duncan filled out a series of questions at the airport about his health and activities in the weeks before his flight. According to a copy of the form (PDF), he answered no to all of them. Among other questions, the form asked whether Duncan had cared for an Ebola patient or touched the body of anyone who had died in an area affected by Ebola. "We expect people to do the honorable thing," said Binyah Kesselly, chairman of the board of directors of the Liberia Airport Authority in Monrovia. The agency obtained permission from the Ministry of Justice to pursue the matter. Neighbors in the Liberian capital of Monrovia believe Duncan become infected when he helped bundle a sick pregnant neighbor into a taxi a few weeks ago and set off with her to find treatment. In Texas, health officials have reached out to about 80 people who may have had direct contact with the man who brought Ebola into the U.S. or someone close to him, a public-health spokeswoman said Thursday. Officials also ordered four members of Duncan's family to stay at home and not have any visitors until at least October 19. None of the people is showing symptoms, but health authorities have educated them about Ebola and told them to notify medical workers if they feel ill. The group will be monitored to see if anyone seeks medical care during the three weeks immediately following the time of contact, said Erikka Neroes, of the Dallas County Health and Human Services agency. The people include 12 to 18 who came in direct contact with the infected man, as well as others known to have had contact with them, she said. "This is a big spider web" of people involved, Neroes said. The initial group includes three members of the ambulance crew that took Thomas Eric Duncan to the hospital, plus a handful of schoolchildren. The ambulance workers have tested negative for Ebola. The Texas Department of State Health Services said Thursday it has a list of about 100 possible contacts but that the official number will be lower. Health officials are focusing on containment to try to stem the possibility of the Ebola virus spreading beyond Duncan, who arrived in Dallas on Sept. 20 to visit relatives and fell ill a few days later. His sister, Mai Wureh, identified Duncan as the infected man in an interview with The Associated Press. A Dallas emergency room sent Duncan home last week, even though he told a nurse that he had been in disease-ravaged West Africa. The decision by Texas Health Presbyterian Hospital to release Duncan could have put others at risk of exposure to Ebola before the man went back to the ER a couple of days later when his condition worsened. The patient explained to a nurse last Thursday that he was visiting the U.S. from Africa, but that information was not widely shared, said Dr. Mark Lester, who works for the hospital's parent company. Hospital epidemiologist Dr. Edward Goodman said the patient had a fever and abdominal pain during his first ER visit, not the riskier symptoms of vomiting and diarrhea. Duncan was diagnosed with a low-risk infection and sent home, Lester said. The hospital is reviewing how the situation would have been handled if all staff had been aware of the man's circumstances. But the diagnosis, and the hospital's slip-up, highlighted the wider threat of Ebola, even far from Africa. "The scrutiny just needs to be higher now," said Dr. Rade Vukmir, a spokesman for the American College of Emergency Physicians. Duncan has been kept in isolation at the hospital since Sunday. He was listed Thursday in serious but stable condition. 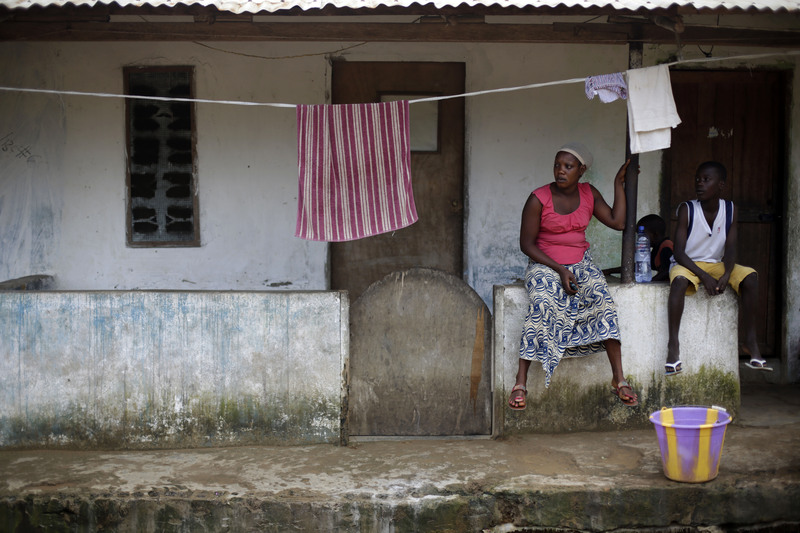 Duncan's neighborhood, a collection of tin-roofed homes, has been ravaged by Ebola. So many people have fallen ill that neighbors are too frightened to comfort a 9-year-old girl who lost her mother to the disease. The 19-year-old pregnant woman Duncan helped was convulsing and complaining of stomach pain, and everyone thought her problems were related to her pregnancy, in its seventh month. No ambulance would come for her, and the group that put her in a taxi never did find a hospital. She died, and in the following weeks, all the neighbors who helped have gotten sick or died, neighbors said. Ebola is believed to have sickened more than 7,100 people in West Africa and killed more than 3,300, according to the World Health Organization. Liberia is one of the three countries hit hardest in the epidemic, along with Sierra Leone and Guinea.